On The Big Bang Theory Season 9 Episode 9, the gang prepares to celebrate Thanksgiving. Leonard and Penny are hosting dinner for their first Thanksgiving as a married couple, while Sheldon and Amy go to the aquarium as friends, and everyone else volunteers at the soup kitchen. Let me start by saying that this is the kind of episode I love. Period. For starters, we're reminded of why we like Penny and Leonard as a couple. Their conversations, the way they act as they plan their Thanksgiving, and all the details Leonard boasts of knowing about his wife are things that make them seem like a relatable couple. You know what else? They can be themselves around each other. If the bit with the orange lingerie doesn't prove that, I don't know what does. Meanwhile, Amy's willing to try being friends with Sheldon, and the pair heads to the aquarium for the weirdest Thanksgiving celebration probably ever. Sheldon asks Amy about the guys she's dating, and she's honest with him. She also tells him that she wants to be happy. It's obvious she still cares for him. Who else would play along with his invented fish game and actually enjoy it? And who else would pack him a bag of mixed Cheerios? 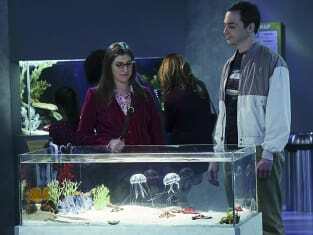 It all goes well, and it feels hopeful that Amy misses spending time with Sheldon like this. She misses it so much, in fact, that she calls him later and tells him she wants to be his girlfriend again, only for Sheldon to reject to her. It's all a little bit infuriating. Yes, Amy has done a good job of standing up for herself, and she's even branched out to start dating. But I wanted her to stand firm on this a little longer, and not just run back to Sheldon after one fun day together. The only bright side to this is Sheldon's response, which is one that comes from a place of genuine emotion. He worked hard to get over Amy, and he can't go back through it all again. I appreciate any time that we see Sheldon's emotion, so in that regard, it's useful. What would be better, though, is if Sheldon could have won her back after learning a little more about how to handle relationships. Howard getting sucked into volunteering at the soup kitchen is just what he needed. Laura Spencer is back as Emily, and I love her interactions with Bernadette as they talk about the guys. Stuart is missing in this episode, and that's a good thing. Less creepy Stuart, please. 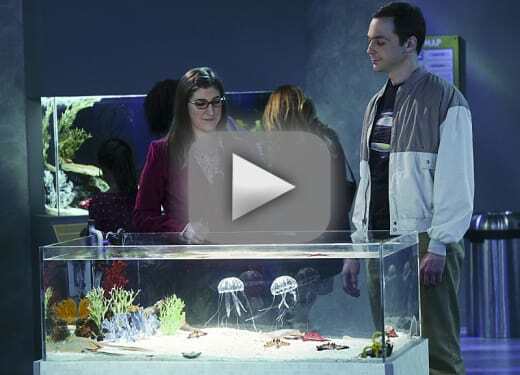 What did you think of this episode of The Big Bang Theory? Share your thoughts in the comments below! Need to catch up on past episodes? You can always watch The Big Bang Theory online right here via TV Fanatic! If there were a list of things that make me more comfortable, a list would be at the top of that list. How many grown ups do you know with Mr. Spock oven mitts? Permalink: How many grown ups do you know with Mr. Spock oven mitts?